This time of year I eat asparagus as often as possible, sometimes every day. But along with one of my favorite dishes — asparagus with butter, with a poached egg, with shavings of a salty hard cheese, like pecorino — I have to read a lot of nonsense about this delicate spring vegetable. I’ve been picking asparagus all my life. It’s more art than science, and an art that’s not well-taught. Same goes with picking it out at market. May I tell you the few things you need to know about how asparagus grows and thus how to buy and cook it? 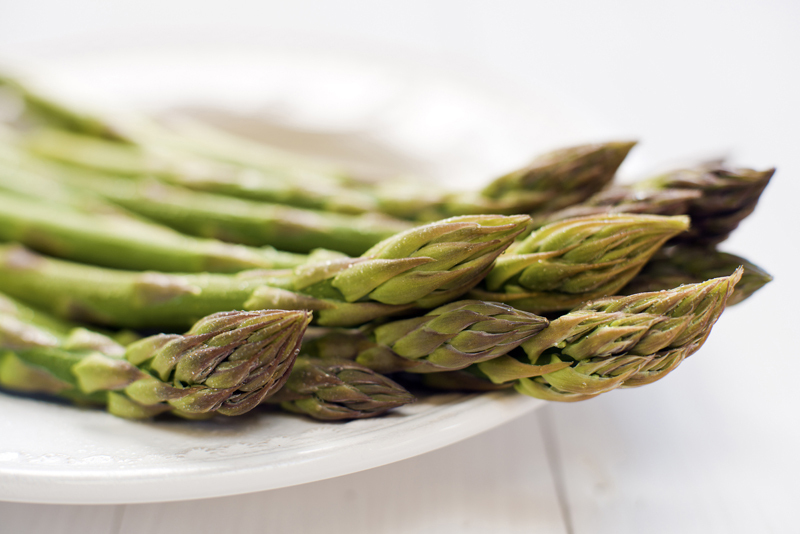 Asparagus grows from a crown — an underground root-like mass. In the spring, the crown sends up shoots — the tender spears we eat. If you let them go, they become leafy fronds, truly beautiful things. If you let the fronds go, they reproduce, making pretty little berries. Meanwhile the fronds are using the magic of photosynthesis and furiously feeding the crown, which grows large to produce spears (and fronds and berries) for next year. But in May and June, farmers don’t let the spears grow: they cut them for you and me to enjoy. What the farmer who seeks perfect maturity looks for — or should — is not the spear diameter or height, but the scales. They should not be too closed and tight — that’s too young. Nor should they be splayed out, starting to reach away from the spear tip — that’s too old. In the perfect spear, the tip looks like a mermaid’s tail: smooth, but not tight. Let me repeat: it doesn’t matter whether the spear is fat or thin. A crown may send up mostly thin, or mostly thick, spears — or both, depending on a host of factors: soil fertility, how much heat and water the patch has had in the past 24 hours (you pick asparagus every day), and how old or healthy the crown is. Probably the variety matters too, but I’ve no experience with that. All that matters to you, the cook, is how those scales look. Thick or thin, the spear will be perfect if the scales are perfect. Moreover, in fine hot weather with plenty of water, asparagus grows thick and it grows fast. It can be too old in 12 hours, so it matters whether the farmer cares about picking it properly. It does help to buy stalks with a similar thickness: they cook evenly. But I don’t find it onerous to drop the fatter ones in first. You can’t afford to be away from the pot when cooking asparagus anyway. It’s not the time to fold clothes or call your mother. If any stalks (fat or thin) are fibrous, that only means they’re a little too mature. Do, by all means, break them at the breaking point (as all good cooks advise) and peel off the tougher outer skin. The core is usually tender. But forget the nonsense about slender = tender. It goes along with other rubbish about baby vegetables — I’m referring to tasteless miniature French beans, micro-leaves, and doll-sized, watery zucchini. I saw “infant arugula” on a menu once, but I prefer mine all grown up.